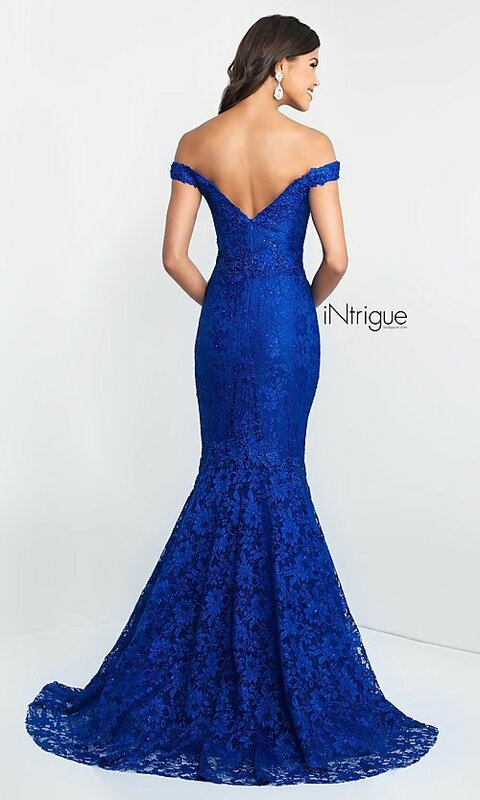 Chic and stylish, this long lace off-the-shoulder mermaid prom dress from Intrigue by Blush will ensure prom 2019 is a night to remember. The off-the-shoulder sweetheart neckline of this long lace prom dress complements the open v-back for an alluring, yet sophisticated style. The body-contouring lace evening dress hugs the curves and highlights the shapely profile. Creating a stunning hourglass figure, the mermaid skirt on this long lace prom dress flares out just above the knees. 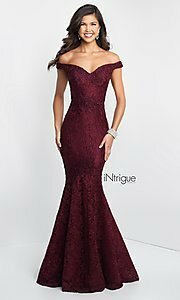 Paint a picture of grace and romance when you slip into this formal floor-length off-the-shoulder sweetheart prom dress from Intrigue by Blush.